Boxing or most of us, needs no introduction. We have seen boxing matches on television for years. The Americas have, for the most part, dominated the sport. Most of us grew up in the era of great boxers like Mohammad Ali, Roberto Duran, Sugar Ray Leonard, Mike Tyson, Manny Paquiao and many others. In recent years, for those of us who watch mixed martial arts competitions, we see the importance of boxing skills to be the complete fighter. Yet, the intricacies of boxing are lost on many spectators. They see a great knock-out or a boxer who seemingly can’t be hit. In reality, that knockout punch came from a great set-up using a combination of punches. The boxer who is rarely hit has great footwork, slips and other deceptive skills. 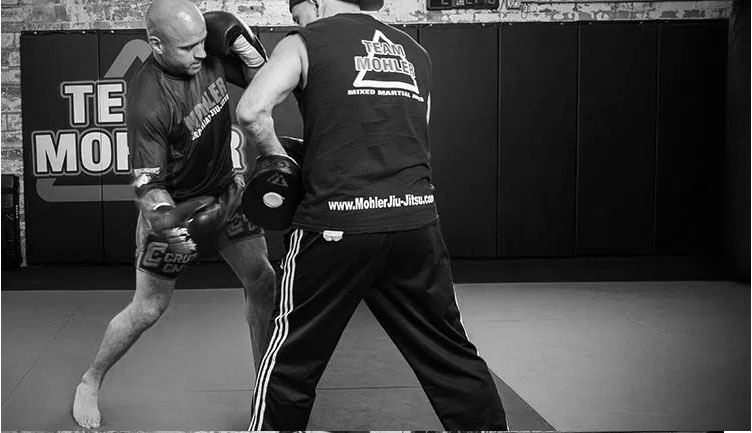 Our boxing classes at Mohler will not only familiarize you with these techniques, but will enable you to use many of them yourself. The key to stand-up fighting is your hands. Our boxing instructors will improve both your offensive and defensive skills through a series of drills. These drills incorporate the heavy bag, speed bag, shadow boxing, and focus mitts. Our instructors will teach you how to improve your punching power though body mechanics, but maybe more importantly how to throw a combination of punches which increases the likelihood of actually hitting your opponent with a solid punch. The offensive techniques you will learn include boxing footwork (which is the foundation of any stand-up martial art), the various punches (jab, hook, uppercut, cross), punching combinations which can be used while sparring or in self defense, and counter-punching. Defensively, you will learn how to slip a punch, how to bob and weave, how to parry, block or jam punch, and how to keep yourself off-line so that your opponent has difficulty finding his or her target. Our gym and boxing program is a great cardio workout, as well. You will be amazed how your body will respond to these drills through weight loss, cardio conditioning and stress release. Our classes include boxing conditioning drills, such as jump-rope drills, running, ring work, plyometrics, isometrics and sit-ups. Our spacious boxing gym at our Coppell location boasts a full-size cage, with plenty of room to work out. There, Mohler Mixed Martial Arts has been host to many top golden gloves champions. While our Dallas location is not as spacious, it also has a full-size cage, and plans are underway to expand our facility. Advanced students can participate in coached sparring. Private lessons are also available by appointment. Whether you want to just get in shape, stay in shape or train for the Golden Gloves, we welcome you to our boxing gym.